Journals come in all sorts. The main quality of a competent gardener must surely be the skill of accurate observation. However, observations on their own do little to help us unless they are recorded in some way so that they may be referenced at a later time. 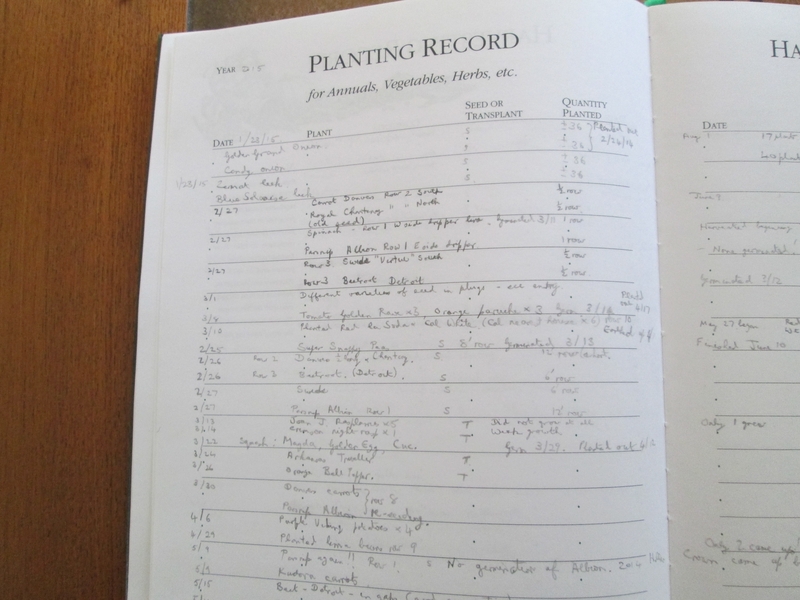 Keeping records of ones horticultural endeavors over a period of years is surely the best way to develop knowledge and experience as a gardener. 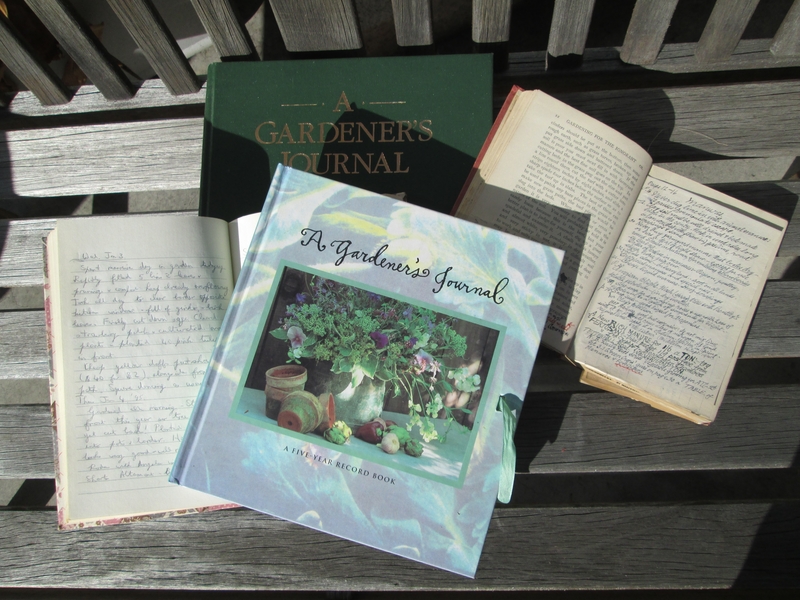 I was therefore delighted, if a little daunted, to receive a very substantial ten-year Gardening Journal (from Lee Valley Hardware) as a present many years ago. There are numerous ways to record what goes on in the garden through the year; old school notebooks, loose-leaf binders, purposely designed diaries, and even by annotating published gardening books with ones own notes. Indeed one of my most treasured books was published in 1911 and belonged to my grandfather who added copious notes in every margin, together with newspaper cuttings about the latest horticultural research, and advertisements from various mail-order companies selling obscure plants. And for those who have lost the art of using paper and pencil there are numerous computer programs offering templates, and apps for smart phones, some of which are free. Choosing the right format is a personal decision. Some diaries are very artistically designed and beautifully presented but I found not very practical with hardly any space for entries. My attempts to use loose leaf binders or notebooks were failures since I tended to start with gusto at the beginning of the year, but somehow never kept my enthusiasm going beyond May. There are many online journals and diaries but unfortunately they often fail to show how the book is formatted, preferring instead to highlight the artistic cover, and this makes it very hard to assess its usefulness. However, my 10-year version is delightfully and practically laid out so that entries are easy to make, and year by year comparisons are under each other on a page. There are separate pages for entering seed-sowing and planting dates which also include harvest dates and yields, plant inventories and plant purchases. 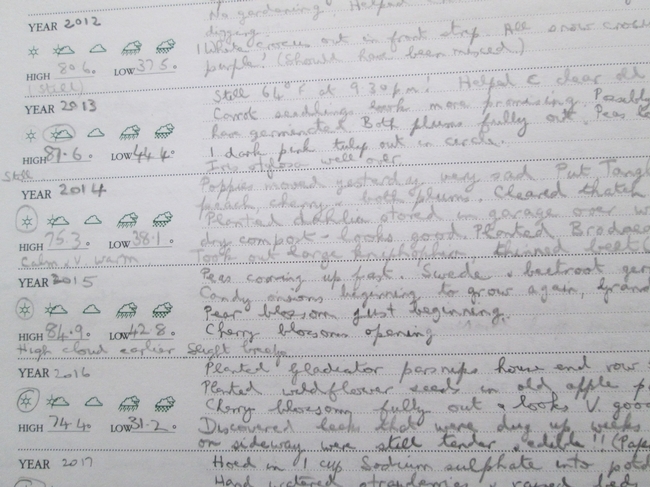 There are pages printed with grids for planning one's garden which have proved invaluable for recording such things as underground irrigation pipes. And there are sound tips and ideas on how to grow various crops. 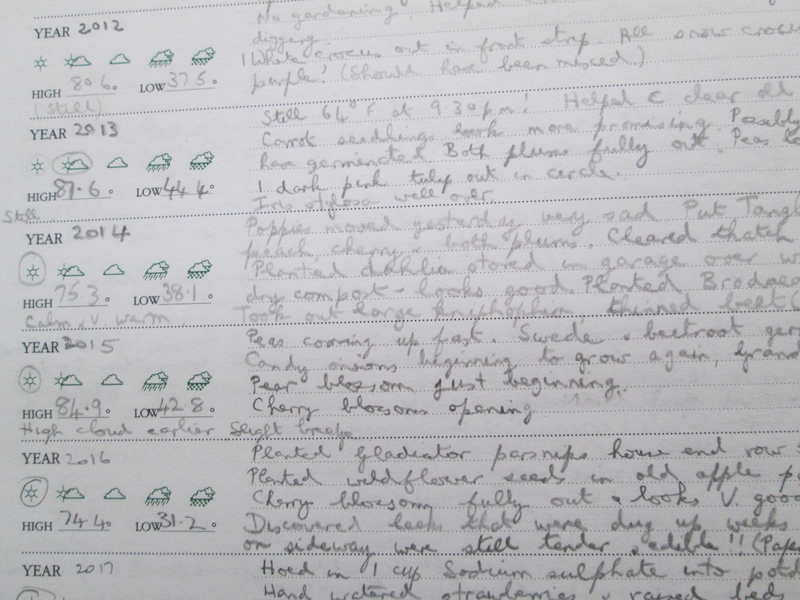 Each entry has a weather record with places to record maximum and minimum temperatures, and then just plain lines for the entry. I much prefer this to the types which have lots of headings such as “lawn”, “bulbs”, “flowers”, “fruit” or “greenhouse” on each page because there are many times of year when half the headings are not applicable. The only downside to my version is its substantial size, and that there is no ability to add photographs, so these have to be stored in my computer in a “garden timeline” file. I also have to store plant labels separately. So what sort of things do I enter? At this time of year it is often the date that the first blossoms open on various fruit trees and whether I have observed bees out to pollinate them, also when blossoms are over and what the set looks like. I record when I first see native bees in the year, when the first Black-chinned Hummingbirds arrive, and later in the year when the first squash bug is spotted, and how many are hand-picked each day. I record when I plant things and how much I spent to buy them, what has done exceptionally well, and what has failed and died. (These last entries make me quite ashamed to call myself a Master Gardener)! I try to keep a record of yields but I have to admit that in the height of summer I sometimes fail to keep up. I note any soil amendments or fertilizers that I used prior to planting and any observable effects that they had on plant growth, when I pruned my fruit trees, and many, many other details. Without these records it would simply be impossible to remember what I had done each year. The first entries in the tome were in the winter of 2010-2011 and for several years I thought that I had made some sort of error since the temperatures and rainfall seemed to be so inconsistent with all the subsequent years which had much warmer temperatures. That is until this year which pretty well matches my earliest entries. Taking just one day in the year, March 8, my entries show that the blossom on a Santa Rosa plum behaved as follows: 2012 “Well out”, 2013 “several blossoms out”, 2014 “Well out with some unopened buds”, 2015 “Well over”, 2016 “Well over”, 2017 “Buds just showing some white”, 2018 “Nearly out”, and 2019, “No flowers open, buds white”. It is helpful to set aside a certain time of day to make entries so as to remain consistent. For me I find that just before retiring for the night works well, and I seldom miss a day if I keep to that time. Just as I have enjoyed reading my grandfather's entries, I hope that someday one of my grandchildren will get pleasure from my efforts.